It is a big challenge to keep intact all your important documents, photos and other media contents spread across different devices and on online. Another cause of concern is to access them when they are needed in quick time so that you do not waste your precious time. In such a scenario you have two options – either you store all your data on cloud service or store them in a trustworthy physical product which remains in your possession. The difference between cloud storage and physical storage is that you are required to pay subscription charges for cloud storage service every month whereas you have to invest only once on a physical storage device. Another important difference between Cloud Storage and physical storage is Security of your stored data. When you opt for any cloud service you are not sure where the servers are located and if they are breached or hacked then your important data get leaked which would put you in lot of difficulties. In this scenario comes the WD My Cloud Home storage device which remains in your home and is available in different capacities to meet with your requirements. It is available in 2TB, 3TB, 4TB, 6TB and 8TB sizes in the price range starting from INR 11,490 onwards up to INR 25,000 as their best selling price, online. The My Cloud Home comes in single-drive and dual-drive options but here we are reviewing the single drive with 3TB capacity. This device enables you to store all your content and documents at one centralised place to be retrieved easily from anywhere. 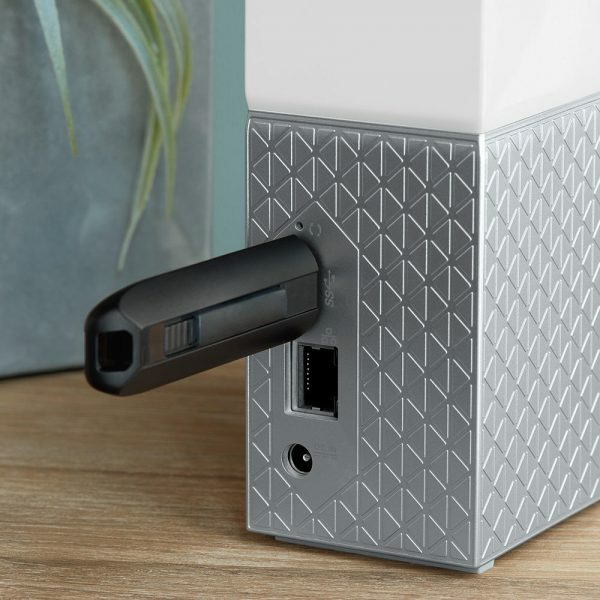 The WD My Cloud Home can be connected to your Wi-Fi router and this network integrated portable hard drive enables you to run your own personal cloud without fear of getting it hacked. On the specifications front, this storage device is packed with a 1.4 GHz quad-core RealTek processor combined with 1GB of RAM. 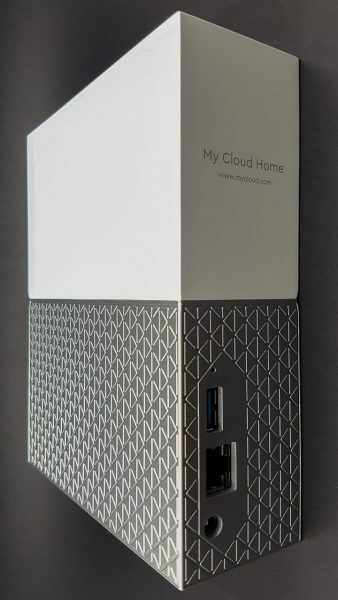 The My Cloud Home looks like any external hard disk drive. It has a split body design which reflects recently launched My Passport and My Book models. It is made of plastic and metal which gives it a simple look of thick book. The upper half is made of plain white plastic whereas the lower half is metallic with textures on it having pattern of interlocking triangles. On the back there is a single Ethernet and a USB 3.0 port to import photos and videos from external storage devices, and the power socket. This device does not have power on/off button, and status LED indicator is placed in the middle of the front face which gives indication whether it is connected to the internet or not. My Cloud Home is very easy to set up. You are required to plug into your wi-fi router. After this you are required to load My Cloud Website for log in for desktop or mobile app. It is compatible with Windows 7 (64-bit only) or later and Mac OS X v10.10 or later and for mobile it is compatible with iOS 9+ and Android 4.4+ and above. After login, you are set to go and start. From there, you can start importing or exporting content onto this drive using the Windows file explorer or with the new My Cloud Home mobile app. Please note that old My Cloud mobile app does not work on it. You can store everything and all your content in your favourite cloud accounts on it in one place. Photos, videos and files from your cloud accounts are automatically downloaded to your My Cloud Home device, including third party applications such as Plex Media Server, Dropbox, Google Drive and IFTTT and list is expected to increase. You can quickly find photos, videos, movies and docs using easy-to-use search with the My Cloud Home mobile or desktop app, or on MyCloud.com. This process of storing the content or retrieving goes very smoothly. But I have observed that the transfer speed of JPEG files is bit slow whether you are transferring via desktop or on your smartphone. This slow speed may frustrate you when you are in a hurry. Another problem faced by me was in mobile app which takes unusual long time to set up witH social media accounts for contents such as Facebook. This portable hard drive with features of simplicity is an ideal device for accessing your content and videos saved on it, anywhere wherever you have an internet connection. This is an ideal solution for users who want a simple device and want to avoid monthly subscription of cloud service. This device is ideal for storing all your content in a centralised place for easy access. Simplicity, pleasant look and ease of operations are the hallmark of WD My Cloud Home.